No matter how many of their designs I see, I just can’t get over the lovely intricacies of Lockheart handbags. It seems to me that what Lockheart does really well (in general and also specifically on the Lockheart Hidden Jewel Hobo) is make super complicated designs that are simultaneously very wearable. 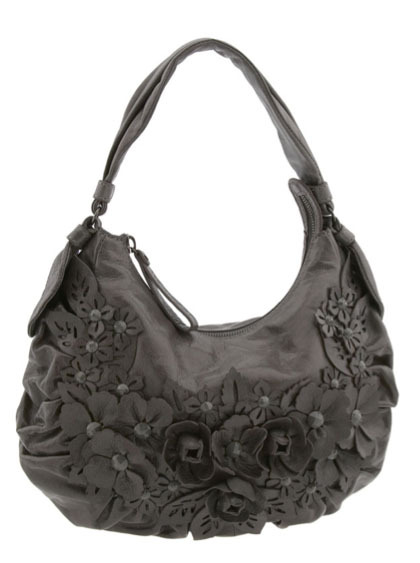 Usually, the way that they accomplish that is by creating a bag with lots of external adornment – in this case, leather flowers – but rendering the entire thing in a single neutral color. The bags have texture and style to spare but are as easy to work into an outfit as a plain bag of the same color – it might seem like a bit of a gimmick, but if it is, it’s a really good one. I have but one criticism of this bag – the foundation leather appears to be rather shiny and thin, and I wish that it was matte and supple instead, but we can’t always get what we want. As it is, this is still a really stylish option for fall and winter. Buy through Nordstrom for $345.